Swimming has been part of my life pretty much as long as I can remember. I started swimming at about 5 at the local pool. There was certainly some tradition of swimming in my father’s family, but it had been a bit mixed. My great-great-uncle Jobie saved a lot of people from drowning (into double digits), but his brother threw my grandfather into the water in an effort to teach him to swim and that back fired. My grandfather didn’t push swimming as a result and my Dad didn’t learn until he was an adult (he learnt in the run up to his honeymoon as he was embarrassed he couldn’t swim). As Dad hadn’t been able to swim till adulthood, he was determined to make sure we could all swim and all five of us had lessons and learnt to swim well. My personal swimming journey started at five years old I think with swimming lessons with Mrs King at the local municipal pool. I soon got the hang of it and started progressing through the badges. At primary school I was good friends with a girl who swam a lot and for a while I joined the local swimming club and started competing in galas. I also swam for my school. Club swimming was a bit intense for me, but I continued with swimming lessons well into my teens. Along the way I collected my 2 mile swimming badge and completed the bronze, silver, gold and honours survival badges. At school I did all my stripes and ended up with a free pass for the local swimming pool (I wish it was still valid now). After that I didn’t swim regularly although I would go with friends or on holiday. At university I did a bit more serious swimming again, but it went by the wayside when I started work. It was back to holiday swimming. Until that is I got pregnant with H. Then I started going to the aqua natal classes at our local pool. Before the exercise session I would swim a few lengths and loved the fact that even when pregnant I could still move as fast and as smoothly through the water as ever. After H was born I continued with aqua natal for a few months until he started to want to move more. At 7 weeks I took him to his first swimming lesson and for the next 3 years I went in the water with him once a week. At three years of age though his swimming teacher started teaching them without their parents, so I got out of the pool. Again I was back to holiday swimming and spectating during H’s lessons. In June 2018 I realised that I wasn’t very fit when I had to run for a bus. I was doing a yoga class a week and walking a lot quite briskly, but it wasn’t enough. I am not a big fan of running and didn’t fancy an exercise class. Swimming came to mind and it seemed to perfect thing to do in the summer too: so much easier to get changed afterwards when you can just slip your feet into sandals rather than messing around with socks and shoes. The first week most of my regular things got cancelled for various reasons so I substituted swimming and went three times. It got me off to a great start. I started going once a week, twice if I could. To begin with I found I could swim fast enough, but had no stamina. 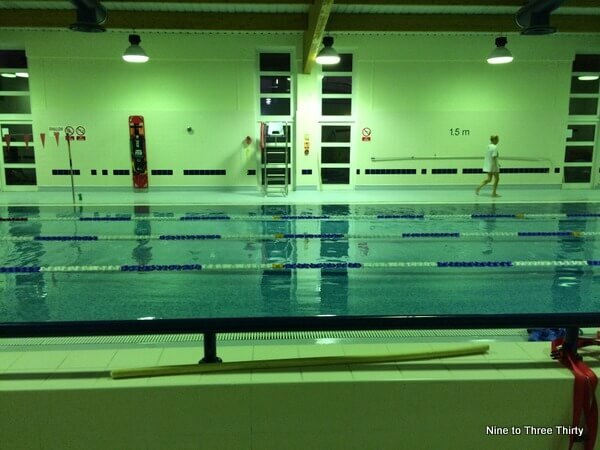 I needed lots of rests and only managed 12 lengths, although they were long ones as the pool is over 30 metres long. Every time I went I upped it a bit more, 2 at a time to start with up to 24, then up to 30 in one step, then 40. I mostly do 40 lengths now as it takes about the right amount of time and I feel it gives me a good workout. Sometimes if I have a bit more time I do 50 instead. I am now going 3 or 4 times a week and I am really feeling the benefit, and I miss it if I can’t go for some reason. Since I restarted swimming I’ve been seeing the benefit. I’m out of breath much less easily. I really notice this when I go hill walking. As well as that I’ve toned up, particularly my arms and torso. Sadly this hasn’t translated into weigh loss, but I’ve found my clothes fit better. I used to love swimming but for many years have been too self concious to be seen in a swim suit. Perhaps if I got one of those ones with short-type legs then I’d be more inclined to give it a go. I love swimming and being in the water but don’t go as often as I should. It is great to read of your rediscovered love of swimming. I really must start going swimming again – I need to improve my swimming as it would make bodyboarding safer.